thanks for the work with the app. Can this control (see picture) be included? Discovered an issue with the Power Strips: I can't add them as devices in a flow (to turn them on/off), and i can only turn them on/off with the old Homey App on the mobile, with the new (beta) app i can't do anything with them. Also, it isn't reporting the on/off status correctly. It says off while it's on, and the other way around. Now had some time to add it to flows and play with it further, but i can't really do much at this point. I can turn it on/off in Homekit because i added it there, but that's about it. I'll push a small fix to the app store which might solve this. It will require you to re-pair the power strip though. I can add the power strips in a flow now. Tomorrow i will test if it turns on when getting out of my bed (alarm goes off), and when i'm coming home from work. But i have no doubt that will work. Also, the device name is now correct. I will test the device status further, but that is not a big issue. When i added it, it said it was turned off while it was on. I will do further testing. This functionality is specific for ZigBee and Zwave devices and not available for WiFi devices. What is stopping you from supplying the necessary details yourself? Alternative is to send a device to the owner of the miio library so he can integrate it first hand. Hmmm, good point. I'll look into it. If you know how Github works I'd appreciate it if you could submit an issue in my repo so I won't forget. Currently working on another app. Hi, latest version seems to drop support of Xiaomi Philips bulb. Is it a compatibility issue with miio? Can you still operate the devices in the latest Mi Home App? A workaround found was to install the previous apk, discover Xiaomi Philips bulb, then upgrade to the new MiHome version. Couldn't add new bulb directly to the new version using discovery, nor is not listed under supported devices, but existing ones can be controlled. Perhaps Xiaomi is dropping support, could also be they just made a mistake. Good to know we have a workaround. Hi, is it possible to add the Xiaomi Short Laser Projector? 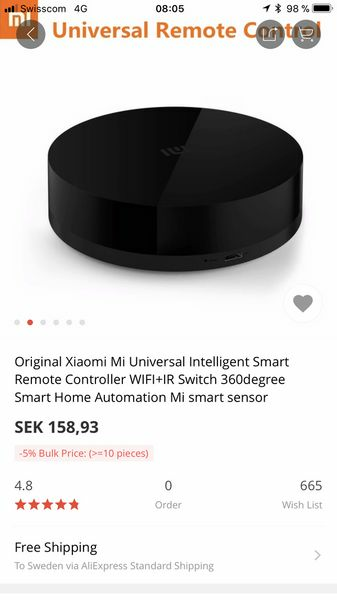 It has android OS and WiFi / ETH connection. It has an IP Address. Edit: Seems to be the same as Xiaomi Mi TV. So is it possible to add this to the Xiamo skill on Homey? No problem, I'll investigate! Thanks!